DANA POINT — Growing up in the Mammoth Mountain area, Erin Nealy has always been into new, active and action-packed adventures. She grew up snowboarding, joining the U.S Snowboarding Team at age 20 and competing internationally. She naturally gravitated toward new water-related adventures when she moved to Dana Point a few years later. During the past decade, Nealy discovered yoga, and she became an instructor eight years ago. She recently started conducting yoga classes on stand-up paddleboards at Lake Mission Viejo. She started her own company — Sunset Standup Paddle — offering classes on both land and on boards, but Nealy said she felt she could do even more. “I’ve always loved being out on the water sailing, and I just thought it would be cool to try something new — something different,” Nealy said. She immediately went to work on an idea involving yoga, stand-up paddleboards (SUP) and an adventure aboard a boat. The result is something she calls “SUP, Sailing and Yoga,” and so far, it’s off to a good start. “Both trips we’ve done so far have gone really well, and it was fun to combine all of the activities into one event,” Nealy said. Nealy recruited her father, Roger O’Malley, charter manager at Dream Catcher Yachts in Dana Point Harbor, to coordinate the charter vessels that could take out her paddling yoga participants, and a new tour idea was born. A typical four-hour trip would have six participants boarding a six-passenger charter vessel and anchoring out in front of a beach location of either the group’s or Nealy’s choosing. Once there, the paddleboards, called BOGA boards — specially designed for performing yoga — are offloaded, and the group paddles out. Nealy then leads the group in a session on the nearby beach, or if the water is calm enough, a lesson on the boards. After the lesson, the group is treated to Nealy’s self-catered organic lunch, as she also happens to have experience as a prep chef and baker. So far, Nealy has organized two group trips — one aboard a 40-foot Hunter sailboat and one aboard a 36-foot Hatteras powerboat. After testing out both, Nealy decided the powerboat gave the group a better platform from which to launch the paddleboards, so the plan is to use powerboats for future trips. 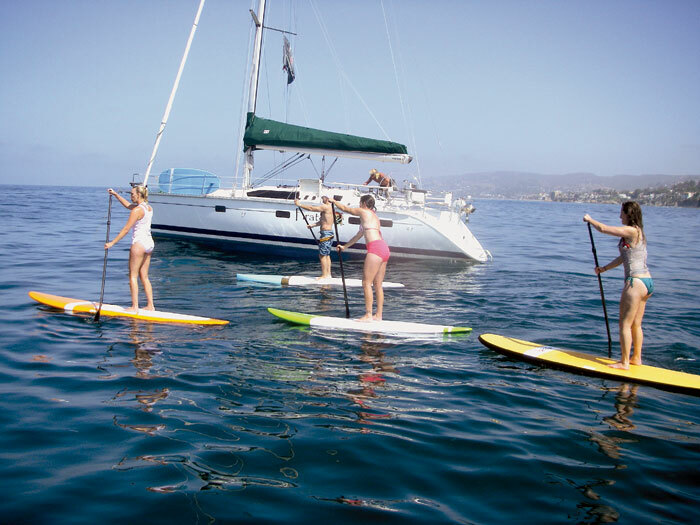 The cost of the SUP, sailing and yoga trip starts at $175 per person for the four-hour session. Nealy has hopes the four-hour trips will spawn longer weekend excursions, where groups can get together and plan a trip to Catalina, performing multiple yoga and standup paddleboard sessions along the rugged coastline. “That’s really my hope — that we can get these trips going on a regular basis in the summer months, and get Catalina trips going so that we have different trips that match people’s price range and desires,” Nealy said. For more information on Nealy’s stand-up paddleboarding, yoga and boating adventures, visit sunsetstanduppaddle.com or email info@sunsetstanduppaddle.com.